MILAN, Italy – Last year was not an easy one for the Italian bicycle industry. The economy was in deep recession by the last quarter of 2008 and it eroded domestic bicycle consumption to some 1.8 million units (a decline of 9.5%) from 1.99 million in 2007. At the same time imports of complete bicycles dropped by 14.8%. Fortunately for the Italians their export markets asked for more bicycles, although the average value of exported bicycles suffered: € 80.71 per bicycle compared to € 90.19 in 2007 and € 100.70 in 2006. According to statistics from ANCMA (the National Association for the Bicycle and Motorcycle Industry) the Italian industry produced a total of 2,380,000 bicycles last year, a substantial decrease of 5.6% on the total for 2007. This market research is based on ANCMA statistics, which do not consider the increase or decrease of the industry stock. Nevertheless the statistics are rather reliable since the stocks are more or less stable in Italy. But in 2008 it was a different story. Due to VIVI-Bikes shutting down at the end of 2008 a surplus of around 200,000 children bikes went into the market, which could not be taken into the standard consideration by the statistics. To avoid any wrong conclusions in particular on the domestic consumption the decrease of the VIVI-Bikes stock was taken into consideration. The US financial crisis caused by reckless subprime mortgage lending reached Europe only in the 3rd Quarter of 2008. But since Italy’s economy was in poor shape the effects of the world financial difficulties hit the country as early as May 2008. Cars were not selling, even with incentives, by June. Consumer spending on bicycles went down in the last quarter of the year. By the end of 2008 companies were feeling the financial pain and VIVI-Bikes SrL a large children’s bicycle manufacturer stopped answering its phones at the end of 2008. By the end of the year, the industry was "in pretty bad shape" according to Pietro Nigrelli, in charge of the bicycle sector at ANCMA. 2008 was with out any doubt a difficult year for the bike industry. The uncertainty about the economic situation did not help at all. According to ANCMA statistics, Italian bicycle production fell 5.6% from 2.52 million to 2.38 million bikes. The volume of bicycle exports increased, however. A total of 1,553,409 bicycles crossed the Italian borders; compared to the 2007 total of 1,357,991 units, a very healthy increase of 14.8% and a positive development which started in 2006. But the average value of the exported Italian bicycles went down by 10.5% to € 80.71 (2007: € 90.19 in 2007 and 2006: € 100.70). This is a clear sign that Italy does not export high-end bicycles in large numbers any more. Less worrying for the Italians is the decrease in bicycle imports, which were down 14.8% to 704,280 units (2007: 827,080). But the average value of the imported bicycles into Italy went up by 18.4% to € 111.54 (2007: € 94.22) confirming a shift away from the cheapest China made bicycles. Due to the fact that VIVI-Bike went out of business at the end of the year and the lack of figures on the clearance of its stock, it is difficult to calculate Italian consumption (normally based on production, plus import minus export). Based on ANCMA’s estimation the deliveries of complete bikes to the various distribution channels totaled 1,800,000 units in 2008, a disappointing 9.5% down on the 2007 figure of 1,989,089 bicycles. The statistics for 2008 are not very clear, as mentioned above, and that is why the breakdown of the different bicycle types cannot be made accurately. Nevertheless ANCMA thinks that there was no real change in bicycle usage in 2008. Mountain bikes continue to be used for leisure with a market share remaining at about 33%. City and Sport bikes represent only 18% of Italian bikes. Road racers, vital for the Italian industry, have a market share of 4%. Bikes for children and juveniles are the biggest category at 45% of the total. For the first time since 1999, bike imports decreased substantially: by 14.8% from 827,080 to 704,280 units. Hopes that imports will decrease even more seem justified but the possible surging of the e-bike segment which is based mainly on import bicycles could turn the situation around. 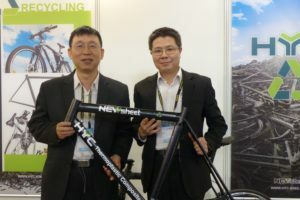 In any case, the import prices are gradually getting higher, proving that the anti-dumping duties for low-cost import from China to protect the Italian bicycle industry is working. The average price of imported bicycles increased substantially. The price went up 18.4% to € 111.54 compared to € 94.22 in 2007. 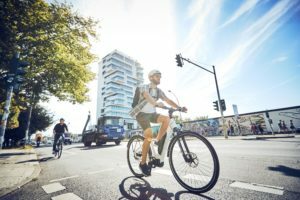 The possible surging of the e-bike segment in Italy could lead to an increase in bicycle imports since it is based on the import of low-cost e-bicycles at the moment. The local production cost is too high to compete against low-cost low-technology of Chinese e-Bikes. At this point the question arises if anti-dumping measurements have to be considered seriously to protect Italian and European e-bike production. The e-bike was not yet an important segment in Italy in 2008. It is estimated that some 10,000 e-bikes were sold in 2008. Unfortunately consumers are still not accustomed to using bicycles for going to work and they spend large sums of money only on sport bicycles. 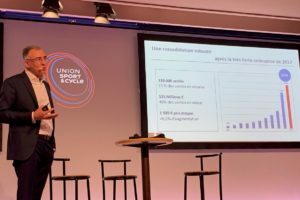 The actual end-user price of e-bikes is roughly € 1,000 which is not good enough for a high-quality e-bike. 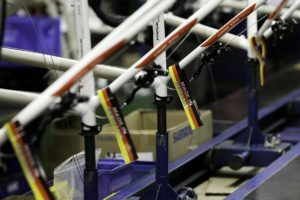 Italy with companies like Campagnolo and various saddle makers is one of the few European countries with an extensive bicycle component industry. In 2008 the export of parts and components went down after very positive figures in 2007. The Italian ISTAT Statistics Bureau shows that the export value of Italian-made components declined by 6.8% from € 425.02 million to € 396.23 million in the year 2008. It also meant a loss of 9.6% in the quantities exported. In any case the change in the industry has been very profound during the last few years. The manufacturing of large amounts of different components has been reduced basically to the very healthy and high-value product categories saddles, wheels, Campagnolo products and the famous Italian road-racing frames. Other components have or are more or less succumbing to Far-East competition. The Italian saddle makers have done well and recorded an overall 6.7% export increase in 2008 in value to € 77.06 million from € 72.21 million, but that meant a 3% decrease in quantity. The anti-dumping duties on saddles imported from China did not stop the concentration of Italian saddles into the high value segment. This trend is likely to continue in the future. An evaluation of high value products like wheels is difficult because the statistics do not classify these products in a specific group. Some of their segments, e.g. rim exports, decreased in export value by 18.2% to € 8.26 million. This means some of the gains recorded in 2007 were lost. The large increase in exports of chainwheel sets from 2007 was partly lost in 2008. The statistics show this segment declined by 21.1%: from € 26.6 to € 21 million. But these latter figures are difficult to evaluate since the increase was suspiciously high in 2007, indicating an error in the statistics. The export increase of gears for group sets was a good one: plus 3.7% in value to €16.64 million and plus 24.1% in units. These figures show a trend towards slightly lower priced products in 2008. After saddles the well known Italian frames are the products which are exported in high quantities. Their export value increased again this time by 7.5% to € 25,71 million from € 23,9 million. The e-Bike was not important in Italy in 2008. It is estimated that some 10,000 e-bikes were sold last year. Consumers still prefer to spend a lot of money only on sport bicycles. The actual end-user price of e-bikes in Italy is roughly € 1,000, which does not buy a high-quality e-bike. The image of e-Bikes is growing in Italy but it is far from the status they enjoy in northern European countries. Nevertheless it is expected that the consumption of e-Bikes should go up to around 30,000 units in 2009. But there it is doubtful if prices would ever reach the level in Holland. The decrease in domestic consumption of bicycles of 9.5% in 2008 was very disappointing for the Italian industry association ANCMA. Unfortunately the year started with a very uncertain economic situation. The economy was stuttering by March and the worst started in June. During the last quarter of 2008 Italy was in the middle of the economic crisis. Under these circumstances the decrease of bicycle consumption is an unsurprising development. At the beginning of 2009 the situation became worse due to the harsh winter. By that time lots of companies in the bicycle industry were in big trouble. Fortunately ANCMA managed to get the government incentive scheme started by 22nd April 2009. “We are very happy to manage to get the incentive scheme running just at the right time, otherwise it could have been very bad for some well known companies”, reported Pietro Nigrelli of ANCMA, who did not want to give any details about the companies in difficulty. “We were completely surprised by the positive effect the incentive scheme had on the consumers“ concluded Nigrelli. Consequently he expects 2009 to be a positive year for the bicycle industry. More in the separate story on the Italian incentives for bicycles on these pages. MILAN, Italy – European governments sometimes give incentives to the public to purchase cars. Think about the incentives given by the German government to purchase cars at the beginning of 2009 which sparked enormous demand and led the car factories to do additional working shifts. But what is normal for cars and in Italy also for PTWs is unknown for bicycles in Europe. The big exception was made in Italy on 22nd April 2009 when for the first time in Europe a government gave direct incentives for the purchase of bicycles. The result was more than expected – in fact it was phenomenal for the bicycle industry. The scheme proved so popular that the € 8.75 million allocated to spur consumer purchases was spent by 19th May 2009 at 10:30 AM – less than 4 weeks from the start of the promotion. Actually the money would have been used even in a much shorter time if the server at which dealers had to file their applications had not become overloaded as too many dealers tried to log on. “We had to work long hours at night to be able to file our requests,” said one IBD in the Piamont area. Pietro Nigrelli of ANCMA says: “We were completely surprised by the effect the incentive scheme had on the consumers. Since we did not have any experience with the impact bicycle incentives would have on consumers and dealers we just used a standard server for the registrations. When we noticed the huge amount of applications entering the server it was too late. Next time we will use a more advanced program which can handles large amount of transactions in a very short time,” he concluded. The Italian government gave an incentive of 30% of the bike purchase price up to a maximum amount of € 700.00 for the purchase of a new bicycle. The incentive was valid for a purchase price of up to € 2,330 in the store. The money was given for the purchase of normal bicycles and e-Bikes. The incentives were also given to purchasers of scooters either with an EURO-2 engine or electric powered. In these latter cases the writing-off of a scooter EURO-Zero or EURO-1 was mandatory. But what was good for the sale of bicycles was not to the advantage for the scooter business at all. A total of 40,408 applications were concluded successfully in the scheme by the 19th of May out of which 40,270 (99.7%) requests were for bicycles, 1 was for one electric PTW and 137 were for PTWs with motorized engines. In money terms € 8,709,253 (99.5%) of the € 8.75 million went to bicycle purchasers; while only € 0.041m went towards other vehicles. The main reason for the unequal result seems to have been the paperwork needed for writing-off an old EURO-Zero scooter when purchasing another vehicles. But at the same time it was the first time such an incentive was given for purchasing bicycles and it attracted the public in large amounts. The 30% saving on the purchase price proved very attractive to consumers. One fact is clear: the bicycle industry has been suffering badly since the last quarter of 2008 due to the economic crisis. Additionally the first two months of 2009 were particularly difficult for the industry due to unusually cold weather as well as the banks cutting back on loans to the industry, IBDs and consumers. As Nigrelli told us “some good names in the bicycle industry were on the brink of closing their doors at the end of the first quarter of 2009”. As VIVI Bikes SrL did. 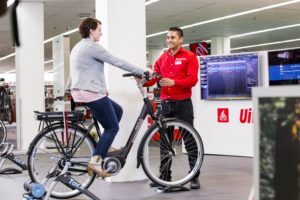 The incentives came just at the right moment for the industry “because of the incentives and the stir it caused with consumers it looks as if 2009 is going to be on target for the bicycle industry, after a very difficult 2008 and a bad 2009 start” added Nigrelli. Not only did IBDs sell over 40,000 bicycles in a very short time but more importantly they got lots of consumers into their shops. Indeed it seems more people sort of woke up and started cycling again in Italy. This development is surely partly a result of lots of people losing their jobs or working short-time: they are using their bicycle to reduce their petrol bill. In any case the scheme proved so popular that the Ministry for the Environment has decided to allocate another € 10 million towards the purchase of bikes and ecologically friendly PTWs in a new scheme for 2009. The latter incentives have not been released yet due to the complex administrative work and the need to define the target group more accurately. Since the PTW industry did not get any advantage from the last incentive scheme an amount of € 5 million of the new scheme will be dedicated to PTW purchases. The other € 5 million will be targeted at bicycle consumers. In the new scheme the incentive for each bicycle purchase will amount to only up to € 200 per consumer. The start of the new scheme is scheduled for mid-September 2009. There is already a discussion about whether the time scheduled is the right one. The success of the incentives for bicycles in Italy is surely a good example for other European countries. Such schemes would pay off immediately since they would help to improve the quality of the air in polluted large urban areas. This is the main challenge for any European government these days.